Tildipirosin is a 16-membered ring, tribasic and semi-synthetic macrolide antibiotic. The aim of this study was to determine the safety of tildipirosin following a single treatment at doses of 4 mg/kg and 8 mg/kg via subcutaneous injection. In the current research, tildipirosin (SC, single treatment) was applied at the doses of 4 and 8 mg/kg to the Normal Dose (ND) and High Dose (HD) group, respectively. Blood samples were gained before (0th d) and after treatments on 0.25, 0.5, 1, 3 and 21 d’s. Hemogram, biochemical and oxidative stress parameters were determined from blood samples. High dose tildipirosin increased cardiac damage parameters including creatine kinase-MB mass and partially troponin I within the first day, and high dose tildipirosin decreased statistically significant the thiobarbituric acid reactive substances levels on 1 and 3 d compared with ND group. Statistically significance fluctuations within reference ranges were observed in the biochemical and hemogram values. In conclusion, high dose tildipirosin may cause cardiotoxicity in sheep. However, cardiography, monitorization and histopathological evaluations should be done to determination of adverse effects of different doses of tildipirosin in sheep. Respiratory system diseases have high morbidity and mortality rate in ruminants. Pasteurella multocida, Mannheimia haemolytica and Histophilus somni are the group of bacteria recognized as important pathogens in sheep. Therefore, the treatment is forefront [1-3]. Currently used antibiotics have been reported to develop resistance against these infectious agents depending on mutations and methylation [4,5]. However, tildipirosin has declared to least resistance developing antibiotics in macrolide group . Antibiotics of macrolide group have cardiotoxic, nephrotoxic and hepatotoxic side effects. Especially tilmicosin causes the death in goats. Also, the drug can cause the death in target species including cattle and sheep [6-9]. Tildipirosin is newly synthesized and semi-synthetic-16 membered macrolide antibiotic that is similar structurally to tylosin and tilmicosin . These antibiotics bind to 50 S ribosomal subunit of the bacterial cell wall. It has been approved by European Medicines Agency (EMEA) for the treatment of Mannheimia haemolytica, Pasteurella multocida and Histophilus somni infections at the single dose of 4 mg/kg (SC) in cattle [11,12]. Also, tildipirosin is used in the treatment of these infections in pigs . Tildipirosin treats the respiratory tract infections and prevent chronic inflectional diseases in transported cattle . The administration of tildipirosin is more effective than tulathromycin in Mannheimia haemolytica induced experimentally lung infection . Tildipirosin has the long half-life and the large volume of distribution, and it remains long-term in the lung tissue (21-28 d) . It has been used as extra label in sheep and other species, although its use in cattle and pigs has been approved by the EMEA. Though 4 mg/kg (single dose, SC) dose of tildipirosin is safe for cattle, 10 mg/kg (single dose, SC) dose may show cardiotoxicity in dogs [11,12]. Furthermore, EMEA and FDA have reported that it might cause the restlessness, ground to sleep, cough and severe inflammation, itching in injection site [11,12,16]. In addition, severe convulsions, lying behavior, wriggling, deep breathing and more frequent breathing, and serious loss of coordination has been observed before death in mice. Also, redness and itching has been stated in injection area [12,16]. Drugs may be beneficial as well as have some side effects. The side effects can result with changes in biochemical and hematological parameters [7,17,18]. Creatine kinase-MB mass (CK-MB mass) and troponin I (TnI) levels are evaluated for cardiac damage or cardiotoxicity, at the same time Thiobarbituric Acid Reactive Substances (TBARS) levels can be measured to determine the oxidative stress and the cellular membrane damage . In the current research, it was aimed that determination of biochemical, hematologic, cardiac and oxidative stress parameters following normal (4 mg/kg, SC) and high dose (8 mg/kg, SC) administration of tildipirosin in sheep. It was also determined the difference between normal and high doses in these parameters. Twelve Akkaraman sheep (4-5 ages, 50-60 kg) were used in the study. They had a known any drug exposure at last two months. Sheep were acclimated at least 14 d prior to dosing. They were examined by a veterinarian during the acclimation period, and only clinically healthy animals were selected for inclusion into the study. They were housed individual pens and fed twice daily with a commercially yearling feed; in addition, they received barley, vetch hay and sugar beet pulp ad libitum. Fresh water was available ad libitum. The study protocol was approved by Selcuk University, Faculty of Veterinary Ethics Committee and animals were handled with consideration for their welfare in Selcuk University Faculty of Veterinary Medicine Animal Research and Application Center. The sheep were divided into two groups including 6 animals and average weights were similar in each group. To the Normal dose (ND), tildipirosin (Zuprevo® 18% inj., Merck Animal Health) was administered subcutaneously into axillar area at the recommended clinical dose of 4 mg/kg (single dose). To the High Dose (HD) received tildipirosin with the same route at the dose of 8 mg/kg (single dose). Blood samples were collected by the catheter inserted into V. jugularis before (0th d, control) and after administration on 0.25, 0.5, 1, 3 and 21 d. The clinical inspections of the animals were performed with regard to the respiratory and digestive system at 0.5 d intervals for first 3 d and 1 d intervals on later days following tildipirosin treatment. Blood samples were collected into potassium-ethylene diamine tetra acetic acid (K-EDTA) and serum separator tubes. Blood samples in K-EDTA tubes were used to determine hemogram parameters (Red Blood Cells (RBC), White Blood Cells (WBC), platelets, hematocrit, hemoglobin) by hematology analyzer (BC-2800 Auto Hematology Analyzer, Mindray Bio- Medical Electronics, Shenzhen, China). The serum fraction from each blood sample was separated to define biochemical parameters (albumin, alkaline phosphatase, alanine aminotransferase, aspartate aminotransferase, total bilirubin, blood urea nitrogen, cholesterol, creatine kinase, creatinine, gamma glutamyl transferase, lactate dehydrogenase, total protein, triglyceride) with autoanalyzer (ILab-300 plus, Instrumentation Laboratory, Milano, Italy). Serum CK-MB mass and TnI values were analysed by immunoassay analyzer (Centaur XP, Siemens, Erlangen, Germany). Serum Thiobarbituric Acid Reactive Substances (TBARS) (TBARS Assay Kit, Item number: 10009055 Cayman Chemical Company, USA) levels were determined by ELISA reader (MWGT Lambda Scan 200, Bio-Tek Instruments, Winooski, VT, USA) for the determination of oxidative status. Data were presented as mean ± SE. The data was to be evaluated by Independent t test between groups at different time points (SPSS 22.0). P<0.05 was considered to be statistically significance limit. Effects of tildipirosin on the serum biochemistry are presented in Table 1. Although, Albumin (ALB), Blood Urea Nitrogen (BUN), Creatinine (CRE) and Triglyceride (TRIG) levels in ND group were statistically higher (P<0.05) than HD group, Alkaline Phosphatase (ALP) in HD group was higher than ND group (P<0.05, Table 1). ALB: Albumin; ALP: Alkaline Phosphatase; ALT: Alanine Aminotransferase; AST: Aspartate Aminotransferase; T-BIL: Total Bilirubin; BUN: Blood Urea Nitrogen; CHL: Cholesterol; CRE: Creatinine; GGT: Gamma Glutamyl Transferase; GLC: Glucose; LDH: Lactate Dehydrogenase; TP: Total Protein; TRIG: Triglyceride *The dose of 8 mg/kg (HD) is statistically different from the dose of 4 mg/kg (ND). Table 1: Effects of tildipirosin on the serum biochemistry in normal dose (4 mg/kg, ND) and high dose (8 mg/kg, HD) groups in sheep (mean ± SE). Effects of tildipirosin on CK-MB mass and TnI levels are shown in Graphics 1 and 2, respectively. Although CK-MB mass level was higher in HD groups on 0.25 and 1 d compared with ND group, it was higher in ND group on 21 d (P<0.05, Graphic 1). The concentration of TnI in both groups were detected highest on 0.25 d, however statistical difference was not detected between groups (P>0.05, Graphic 2). 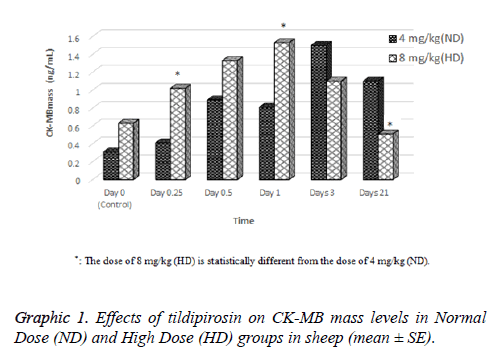 Graphic 1: Effects of tildipirosin on CK-MB mass levels in Normal Dose (ND) and High Dose (HD) groups in sheep (mean ± SE). Graphic 2: Effects of tildipirosin on Troponin I (TnI) levels of in Normal Dose (ND) and High Dose (HD) groups in sheep (mean ± SE). TBARS level of HD group was statistically higher than ND group on 1 and 3 d (P<0.05, Graphic 3). 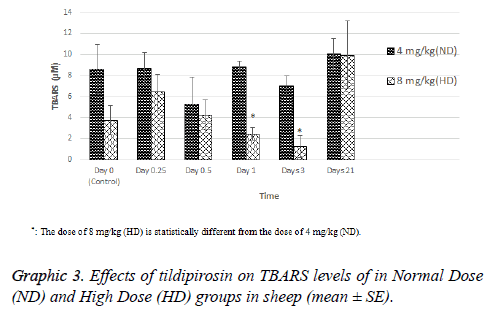 Graphic 3: Effects of tildipirosin on TBARS levels of in Normal Dose (ND) and High Dose (HD) groups in sheep (mean ± SE). Effects of tildipirosin on hemogram values of ND and HD groups are presented in Table 2. In both groups, there were no statistical differences in the levels of hemogram parameters (P>0.05, Table 2). WBC: White Blood Cell; RBC: Red Blood Cell; PLT: Platelet; HGB: Hemoglobin; HCT: Hematocrit. There was no statistically significance in the same column (p>0.05). Table 2: Effects of tildipirosin on hemogram values in normal dose (4 mg/kg, ND) and high dose (8 mg/kg, HD) groups in sheep (mean ± SE). Currently used antibiotics may no effective against Pasteurella, Mannheimia and Histophilus pathogens, because these pathogens can show the resistance [5,20]. In this reason, the use in the appropriate dosage of new antibiotics such as tildipirosin is important . In the current research, clinical dose (4 mg/kg) and double clinical dose (8 mg/kg) have been selected as tildipirosin is strong the dose-response relationship . In the present study, tildipirosin following the subcutaneous administration at doses of 4 and 8 mg/kg caused the mild itching in injection site, the dyspnea and the coughing for 2, 10, 2 d after treatment, respectively. The mild sedation, hunched posture, ruffled feathers, poor coordination, closing the eyelids and severe nasal discharge have been observed after orally the single dose administration of tildipirosin (2000 mg/kg dose) for the acute toxicity test in rats. Deaths following the intravenous administration at higher doses than 12.5 mg/kg have been reported in mice [12,16]. Some drugs can cause the physical stimulation at high concentrations . As tildipirosin reaches to high concentrations in the lungs , it can cause transiently respiratory side effects in sheep. In the current study, cardiac damage parameters (CK-MB mass and TnI) were fluctuated after tildipirosin treatment in both groups (Graphics 1 and 2). On the 0.25 and 1 d, CK-MB mass level in HD group was statistically higher than ND group. However, it was higher in ND group on 21 d than HD group (P<0.05, Graphic 1). In addition, the highest levels of CK-MB mass were on 3 and 1 d in ND and HD groups, respectively. TnI reached peak levels on 0.25 d in both groups, and it was higher in HD group than ND group (P>0.05, Graphic 2). CKMB and TnI levels reach the highest level within first day after heart injury . Also, these parameters rise at 2-6 h after myocardial damage, and they can remain at high levels approximately 12 h [24,25]. Macrolide antibiotics may cause cardiotoxicity and arrhythmia as they increase the permeability in mitochondrial membrane of myocardial cells . It has been reported that tilmicosin causes the cardiotoxicity in lamb , increases CK-MB levels in mice  and enhances TnI and CK-MB levels in rabbits . Tulathromycin have increased TnI and CK-MB mass levels in sheep  and rabbits . Tildipirosin has been declared high levels in plasma within 1 d following subcutaneously administration in cattle . High levels of tildipirosin following the administration may cause the cardiotoxicity with the same mechanism caused other macrolide antibiotics. ALB, ALP, BUN, CRE and TRIG levels were statistically different between ND and HD groups (P<0.05, Table 1). However, these levels were within reference ranges reported for sheep in both groups [31-33]. Treatments of tildipirosin and other macrolides has been reported to change levels of some biochemical parameters such as ALB, calcium, ALT and AST, BUN, CRE, total protein and globulin [11,16,34-36]. In the present study, tildipirosin application in ND and HD groups has no statistically significant effect on the hematologic values (P<0.05, Table 2). In conclusion, tildipirosin following the subcutaneous application at doses of 4 and 8 mg/kg may cause cardiotoxicity in sheep. In addition, the dose increase due to the development of antibacterial resistance may be dangerous. On the contrary, high dose of tildipirosin may decrease oxidative stress for a limited time. However, cardiography, monitorizations and histopathological evaluations should be done for fully determination of side effects of tildipirosin in sheep. Research was supported by the Coordination of Scientific Research Projects, University of Selcuk (Project No. 15401152). The abstract of this study was presented as oral presentation in “5th Animal Health and Veterinary Medicine Congress” September 26-28, 2016, Valencia, Spain. Dassanayake RP, Shanthalingam S, Herndon CN, Subramaniam R, Lawrence PK, Bavananthasivam J. Mycoplasma ovipneumoniae can predispose bighorn sheep to fatal Mannheimia haemolytica pneumonia. Vet Microbiol 2010; 145: 354-359. Lawrence PK, Shanthalingam S, Dassanayake RP, Subramaniam R, Herndon CN, Knowles DP. Transmission of Mannheimia haemolytica from domestic sheep (Ovis aries) to bighorn sheep (Ovis canadensis): unequivocal demonstration with green fluorescent protein-tagged organisms. J Wildl Dis 2010; 46: 706-717. Weiser GC, DeLong WJ, Paz JL, Shafii B, Price WJ, Ward AC. Characterization of Pasteurella multocida associated with pneumonia in bighorn sheep. J Wildl Dis 2003; 39: 536-544. Andersen NM, Poehlsgaard J, Warrass R, Douthwaite S. Inhibition of protein synthesis on the ribosome by tildipirosin compared with other veterinary macrolides. Antimicrob Agents Chemother 2012; 56: 6033-6036. Berge AC, Sischo WM, Craigmill AL. Antimicrobial susceptibility patterns of respiratory tract pathogens from sheep and goats. J Am Vet Med Assoc 2006; 229: 1279-1281. Andrade RJ, Tulkens PM. Hepatic safety of antibiotics used in primary care. J Antimicrob Chemother 2011; 66: 1431-1446. Dogan F. Pharmacovigilance in veterinary profession. Eurasian J Vet Sci 2011; 27: 19-25. Guo D, Cai Y, Chai D, Liang B, Bai N, Wang R. The cardiotoxicity of macrolides: a systematic review. Pharmazie 2010; 65: 631-640. Tras B, Yazar E, Elmas M. Chemotherapeutics. Veterinary drug. Konya, Turkey: Olgun Celik Printing Press 2009; 25-197. Poehlsgaard J, Andersen NM, Warrass R, Douthwaite S. Visualizing the 16-membered ring macrolides tildipirosin and tilmicosin bound to their ribosomal site. ACS Chem Biol 2012; 7: 1351-1355. EMEA. European public MRL assessment report (EPMAR), Tildipirosin (bovine, porcine and caprine species). London: European Medicines Agency 2010. Report No. : EMA/CVMP/709377/2009. EMEA. CVMP assessment report Zuprevo (EMEA/V/C/002009). London: European Medicines Agency 2011. Report No. EMA/197236/2011. Schlegel ER, Blasi DA, Hollenbeck WR, Oleen BE, Renter DG, Spire MF, editors. Performance and health effects of zuprevo 18% in newly received, highly stressed beef cattle. Cattlemens Day; 2014; Kansas State University, Manhattan. Manhattan: Kansas State University, Agricultural Experiment Station and Cooperative Extension Service 2014. Fischer F. Challenge study with Mannheimia haemolytica to the metaphylatic treatment with tildipirosin (zuprevo (R)) or tulathromycin (draxxin (R)). Tierarztl Umsch 2014; 69: 299-302. Menge M, Rose M, Bohland C, Zschiesche E, Kilp S, Metz W. Pharmacokinetics of tildipirosin in bovine plasma, lung tissue, and bronchial fluid (from live, nonanesthetized cattle). J Vet Pharmacol Ther 2012; 35: 550-559. FDA. Zuprevo. Maryland, USA: Food and Drug Administration 2012. Turgut K. Veterinary clinical laboratory diagnostics. Bahcivanlar Printing Industry 2000; 1-549. Corum O, Er A, Dik B, Eser H, Bahcivan E. Determination of the safety of tulathromycin in sheep. Eurasian J Vet Sci 2015; 31: 152-157. Er A, Dik B, Corum O, Cetin G, Yazar E. Effect of halofuginone on blood thiobarbituric acid reactive substances, testosterone and 13, 14-dihydro-15-keto-prostaglandin F2α levels in male yearling sheep. JALSI 2015; 2: 126-133. Michael GB, Eidam C, Kadlec K, Meyer K, Sweeney MT, Murray RW. Increased MICs of gamithromycin and tildipirosin in the presence of the genes erm(42) and msr(E)-mph(E) for bovine Pasteurella multocida and Mannheimia haemolytica. J Antimicrob Chemother 2012; 67: 1555-1557. Amrine DE, White BJ, Larson RL, Mosier DA. Pulmonary lesions and clinical disease response to Mannheimia haemolytica challenge 10 days following administration of tildipirosin or tulathromycin. J Anim Sci 2014; 92: 311-319. Morice AH. Epidemiology of cough. Pulm Pharmacol Ther 2002; 15: 253-259. Hallen J. Troponin for the estimation of infarct size: what have we learned? Cardiology 2012; 121: 204-212. Harrison A, Amundson S. Evaluation and management of the acutely dyspneic patient: the role of biomarkers. Am J Emerg Med 2005; 23: 371-378. Obrien PJ. Cardiac troponin is the most effective translational safety biomarker for myocardial injury in cardiotoxicity. Toxicology 2008; 245: 206-218. Salimi A, Eybagi S, Seydi E, Naserzadeh P, Kazerouni NP, Pourahmad J. Toxicity of macrolide antibiotics on isolated heart mitochondria: a justification for their cardiotoxic adverse effect. Xenobiotica 2016; 46: 82-93. Yazar E, Altunok V, Elmas M, Tras B, Bas A, Ozdemir V. Effect of tilmicosin on cardiac muscle and serum creatine kinases activities and serum total protein level in healthy male Balb/C mice. Rev Med Vet 2001; 152: 881-884. Yazar E, Birdane Y, Elmas M, Tras B, Bas A. Effect of tilmicosin on serum creatine kinase, creatine kinase-MB and troponin I levels in New Zealand white rabbits. Archiv Fur Geflugelkunde 2002; 66: 237. Er A, Altan F, Cetin G, Dik B, Elmas M, Yazar E. Assessment of the cardiotoxicity of tulathromycin in rabbits. Acta Vet Hung 2011; 59: 327-335. Bakar O, Demircay Z, Yuksel M, Haklar G, Sanisoglu Y. The effect of azithromycin on reactive oxygen species in rosacea. Clin Exp Dermatol 2007; 32: 197-200. Bulbul A. Normal hematological values. Sheep goat handbook. Konya, Turkey Billur Publishing House 2013; 509-515. Yokus B, Cakir D, Kanay Z, Gulten T, Uysal E. Effects of seasonal and physiological variations on the serum chemistry, vitamins and thyroid hormone concentrations in sheep. J Vet Med Ser A 2006; 53: 271-276. Dik B, Er A, Corum O. Effect of alcoholic extract of Tarantula cubensis (Theranekron®) on serum thiobarbituric acid-reactive species concentrations in sheep. Eurasian J Vet Sci 2014; 30: 68-71. Alzuheir IM, Abdaldayem MA. The effect of intramuscular injection of spiramycin at therapeutic dose on some blood biochemical and hematological parameters in Assaf sheep. Sci J Veter Adv 2012; 1: 142-146. Clothier KA, Jordan DM, Loynachan AT, Griffith RW. Safety evaluation of tulathromycin use in the caprine species: tulathromycin toxicity assessment in goats. J Vet Pharmacol Ther 2010; 33: 499-502. El-Sawy A, El-Ashmawy I, El-Maddawy ZK, Hussein D. Some pharmacological studies on tulathromycin. J Vet Sci 2013; 38: 113-134.